Simply pour balls into the stacker, cover with tray and invert. 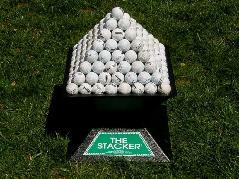 Golf balls come out in a perfect pyramid every time! From Anonymous of Peoria, Arizona on 4/19/2012 . 2/20/2010 – Can I purchase just the plastic trays?